We all know it: keeping kids and toddlers entertained can prove really difficult and nerve-wrecking more so when you want to wean them off TV and games console. 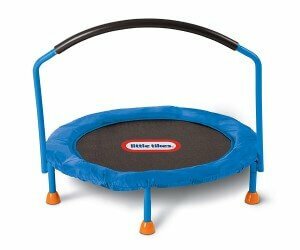 But there’s one surefire way that has been tested and proven to work the world over: a mini trampoline for kids. Some things rarely change; just as we loved to rebound on these fun tools years back, so too is the current generation. The only difference is that the modern day’s rebounders are much safer than what we had back in the day. The best trampoline for kids and toddlers is a combination of a few factors; safety, size, space, and fun. We’ll dig deeper into each of these in another section in this article. Meanwhile, here are our recommendations of the best miniature bouncers for your youngsters this year. Skywalker is a regular name on this site and a highly recommendable brand especially when you are not sure about which trampoline manufacturer to go with. Their 48-inch Round Zoo bouncer is probably the best mini trampoline for kids with enclosure, and it’s not hard to see why. The first feature that attracted us to this model is its spring-free design- a concept that eliminates almost 80% of the common injuries that occur when the jumper either lands awkwardly on the spring area or goes through the spaces. In place of the springs, the Round Zoo uses 30 7.25-inch stretch bands that have again been heavily padded to eliminate the issues of limbs plunging through or been trapped. Actually, the elastic band system is outside the enclosure system and, therefore, gets rid of this risk completely. The jumping mat that offers a usable area of 8.45 Sq. Ft. is crafted from polypropylene and has been woven to offer the jumper a stable feet grip with each jump. In addition, this mat has several images of animals that make the tramp more appealing to children besides giving it its name. Other safety features of this tramp include a wide and stable base that prevents the bouncer from tipping over and a lower enclosure that prevents kids and pets from crawling underneath where they might be hit from above. There is also a 360-degree heavily padded handlebar inside to offer additional support and the enclosure support frames have also been padded for impact protection. The Skywalker Round Zoo bouncer is recommended for kids between 3 and 7 years of age. It’s isn’t so complicated to put up although you really don’t want to do that every day. On the same note, while the frame is weather resistant, most of the other components aren’t. Thus, it’s best used indoors to ensure durability. This model would have easily clinched our number one slot in these reviews had the manufacturer included a safety net enclosure. However, the fact that it is almost 2 folds pricier than the Skywalker Round Zoo above is an indication that it has a lot to offer in terms of usage. One of the best mini trampolines for 2 kids, the Ancheer Mini Rebounder is a rare oval-shaped rebounder with a handlebar that runs across the center to create 2 jumping areas and an impressively high weight limit (220 pounds) that accommodates 2 young jumpers flawlessly. The Ancheer is spring-based, and as we have mentioned in another article on this site, spring trampolines are simply hard to beat in terms of bounce and are, therefore, the best for the jumpiest kids. As you might expect at this price range, the spring system has been heavily padded to give your kid an endless jumping experience with zero spring-related injuries besides giving you peace of mind too. This bouncer’s frame and the handlebar are from heavy-duty steel and have been powder-coated to prevent rusting. But what you’ll certainly like is that once it is fully assembled, you can easily fold this trampoline and stow it away to save on space. This also means that it can be used either indoors or outdoors without having to go through the assembly process over and over again. If you are of the opinion that only an enclosure can make any trampoline safe for a kid, then we are sorry, this model might not fit the bill for you. The heavily padded handlebar, however, makes all the difference by offering additional support to prevent your kids from falling. In addition, this tramp’s low-height and open design makes it possible for you to hold your kids’ hands until they are confident enough to jump on their own. But what’s so unique is that the handlebar can be adjusted from 38’’ to 45’’ and this makes the bouncer safe for kids as young as 3 years. The Clevr 7ft bouncer with a weight limit of 100 pounds is the smallest of the 3 trampolines from this manufacturer; its bigger siblings measure 12ft and 15ft. Since this is a review of the best mini trampolines for kids and toddlers, we chose the smallest model since it is much lower to the ground compared to its siblings and this makes it easy for small kids to climb up without lots of struggles. This trampoline has a pole-to-pole diameter of 7ft/84 inches and a jumping area of approximately 6.5ft. The jumping bed is surrounded by an enclosure featuring a combination of 6 posts and a high-quality polyethylene net that is both strong enough to retain airborne jumpers and yet flexible to resist ripping and tearing. With regard to your kids’ safety, the net support posts have a heavy foam padding to prevent injuries in case the jumper hits them and so does the spring system. There is also an unforgettable doorway with a zipper that can be zipped from either side. This trampoline again has a heavy-duty steel frame consisting of 3 pairs of legs that have been precisely positioned to prevent tipping over. Is it easy to assemble? Well, we could say so; most previous users affirm that they were able to put it up in 1-2 hours albeit the instructions not being so clear. However, note that it might be quite hard to disassemble it if, let’s say, you want to change its location. The good news, however, is that this tramp is weatherproof and can, therefore, pull through winter nicely. Moreover, its small size makes it easy to position it in most kids’ playrooms and this might be a great relief if you live in an area with bad weather climate year-round. The Langxun is yet another irresistible model that we’d highly recommend to anyone who wants a mini trampoline that isn’t so ‘mini’ in terms of the jumping surface but, againg, that which does not put the kids’ safety at jeopardy. Time for honesty: while safety and performance were the leading factors while making our list of the best trampoline for kids for 2019, this bouncer’s eye-catching color pattern really enticed us. Therefore, this might make a really good gift for birthday parties and will suit both boys and girls. 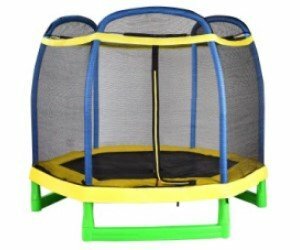 Believe us; your kiddos will love this and the best part is that its price range is way below the $150 mark which, in our opinion, makes it a really good deal for a mini trampoline with enclosure net. The Langxun is a sturdily built bouncer with a diameter of 5 feet (pole to pole) and a jumping surface of 19 sq. ft. Compared to the other models in this list, this tramp is hands down, the best for the most energetic kids. Its relatively higher single jumper weight limit- 220- pounds, on the other hand, is a pointer of how strong the stainless steel rig and legs are. Actually, this manufacturer states that this trampoline can withstand weights of up to 330 pounds. Installation is a walk in the park and what makes it even easier is that all the necessary tools are included in the package. On the same subject, this bouncer can be used either indoors or outdoors. The feet have rubber points to prevent the frame from scratching your floors besides giving the weather-resistant frame a stable grip outside. The Svan is a go-to model for parents who are in the market for the best small trampolines for pre-school, toddlers, and young children. With a diameter of 36 inches and a maximum weight limit of 55 pounds, this is also one of the most affordable bouncers for kids with handlebar out there at below $60 (during the time of this review). This tramp’s construction design is a unique blend of safety, convenience, and fun. From a safety point of view, for instance, this model is spring-free, and as opposed to the elastic bands that the Skywalker Round Zoo uses, the Svan uses bungee cords that offer a much better bounce while eliminating all issues of pinched fingers and backs. In addition, the jumping bed is around 14 inches from the ground and this makes it easy for kids above 3 years to climb up and down with minimal assistance. This bouncer again comes with a padded handlebar that has been slightly curved to ensure that the jumper utilizes the center of the jumping mat as opposed to moving towards the edges- this again prevents the risk of the trampoline tipping over with intense bounce. Here is the best part: the Svan 36 inches kid trampoline is designed for use both indoors and outdoors. But unlike most trampolines for kids, once you’ve assembled this bounce, you won’t need to disassemble it to move it to another location since the entire rig is foldable and the handlebar can also be removed. Notably, this folding design not only makes it a breeze to change the location, but it also makes it possible to store the tramp away after use for people who live in congested apartments. The first consideration that you’ll need to make before heading to the market will be the type of bouncer that you are looking for; a rebounder (regularly known as a mini trampoline) or a standard trampoline. While these 2 names are used interchangeably, they refer to 2 completely different items that are used for entirely different purposes. Besides the variation in design, the differences in these 2 models extend to what your kids can do on them as well as the placement. For instance, the only thing that your kids can do on a rebounder is to jump up and down whereas a large trampoline can allow them to try out a number of gymnastics (with supervision though). In terms of placement, most rebounders can be used both indoors and outdoors. They are also super easy to assemble and disassemble and don’t occupy much space. On the other hand, most standard trampolines can be a tad hard to put up and down on a daily basis. So, you might want to leave them assembled permanently. While there are small trampolines for kids that can be used indoors, others are large and can only be used outside during good weather. Whether you decide to go with a rebounder or a standard trampoline, it’s important that you ensure that it will fit in the location where you intend to use it. If you don’t have a lot of space in your backyard (or you don’t have a backyard at all) you’ll definitely want a model that can fit indoors without compromising fun. Otherwise, a mini trampoline that can be used both outdoors and indoors is always recommendable. It goes without saying that safety should always be your numero uno concern when shopping for a mini trampoline for your children. Most trampoline injuries emanate from flying off the jumping mat and plunging through the spring system. If you are considering a rebounder, our advice would be to get a model that features a handlebar (most of the small trampolines for kids in our reviews have them). On the other hand, most standard tramps come fitted with an enclosure net thereby taking the issue of safety to the next level. However, keep in mind that a handlebar and net don’t always guarantee safety. The temptation to try out new stunts or jumping into danger is enticing for most kids. It really pays to always grab a chair and watch them spring to the fun. Getting a small trampoline for your kids is a great way of maintaining your sanity especially during bad weather. It’s also an easy way of keeping them off the TV without appearing to be over-restrictive. Depending on the available space, you may choose a mini tramp that can be used both indoors and outdoors. Take some time to go through the manufacturer’s instructions though as certain models may not last so long when exposed to elements. In addition, beware of bouncers that might be so hard to disassemble making it difficult to change the location. All in all, we hope that our reviews of the best mini trampolines for kids and toddlers will lead you to a model that your youngsters will love to ride on.